Gray horses are never truly gray. Their coat is a mix of multiple colors, sometimes with a reddish tint, sometimes with a mix of hairs of several colors. This is because gray horses are often born as black, chestnut, or bay. What is common for all of them is that their coat gradually changes to lighter shades of gray with age. Galaxy was 7 years old when I did her portrait, and you can see some chestnut hair from her early days still present in the coat and all sorts of darker hairs too. 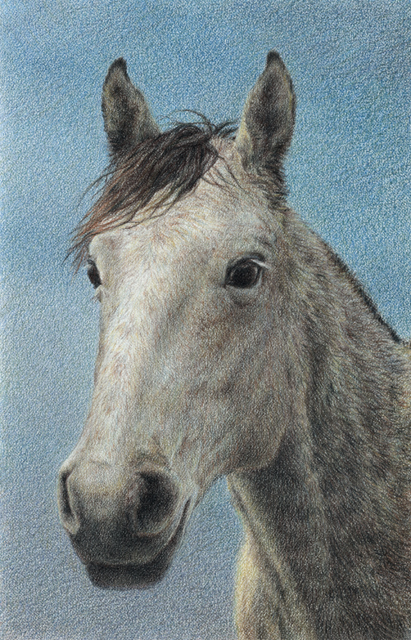 She’s a very beautiful mare that was a pleasure to draw.